The Woodland Confederacy is a historical reenactment organization dedicated to portraying Native Americans of the eastern woodlands. With a membership of over fifty friends and families, we depict the native peoples of the seventeenth and eighteenth centuries, from early colonial contact, to the Seven Years War in America (also known as the French & Indian War) through the American Revolution. Our name signals our diversity: our members portray people throughout the eastern woodlands. Some of us choose our personae from personal interests, others from personal heritage, some from both. Our range of impressions include Abenaki (Micmac, Cowasuck, Pennacook, Sokoki and St. Francis), Iroquois (Mohawk, Caughnawaga Mohawk, Tuscarora, Seneca), Lenape (also known as Delaware), Odawa, Shawnee, and others. Our presentation of native lifestyles and material culture is based on research and study of the period. Our clothing, foodstuffs, and dwelling places are presented as accurately as possible. Confederacy members attend many historical events. Most are Seven Years War (French & Indian) or American Revolutionary period reenactments. Some members portray a much earlier time period - the 1600's -- as guests of the Dutch on the ship, Half Moon, that sailed up the Hudson. You will meet us at such places as Fort Niagara; Fort Ticonderoga; Saratoga; Fort Monmouth, NJ; Fortress Louisbourg in Nova Scotia; Fort Number Four in New Hampshire, and at events hosted by the British Brigade and the Brigade of the American Revolution. We are honored to be invited to several "invitation only" events each year. In addition, many of us bring educational outreach presentations to local schools and community events. and anything and anybody associated with it, past and present. After all, the Old West is not really a time or a place but a state of mind. Jim Janke's Emporium is a great site for many topics. 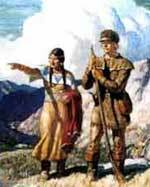 This portion is about the Old West, Native Americans and the Frontier. This group appears to have sort of went away, but left its great website at this link. Here is their original text and below, what they have there now. Nice useful site. The Onaquaga War Party is a historical reenactment organization dedicated to the portrayal of a group of people living in the village of Onaquaga during the periods of 1755-1770 and 1770-1778; thereafter as refugees in the area of Fort Niagara. What they say now: These pages are intended to provide some basic information for beginning Woodland Indian reenactors. They are intended as a guide to portrayals of the northeastern tribes, particularly those of the Six Nations, during the latter half of the eighteenth century. This information should be sufficient to get you started, but is not by any means a definitive guide. The more research you can do into your own particular area, the better your portrayal will be. Demonstrates the lifeways and culture of the 18th century Southeastern Native American Tribes. Mesawmi is a group made up of mix of Native reenactors (Shawnee, Delaware, etc.) in the West Virginia area. Mesawmi is contently growing and changing. (HOTAO) is a multicultural, nonprofit organization, offering educational and environmental awareness programs. We are dedicated to preserving the history, culture and traditions of Florida's original native peoples, while promoting respect for Mother Earth. By recreating the world of Florida's First People, we honor the Ancient Ones who once cared for this land. A historical reenactment organization dedicated to the portrayal of the active period of the British Southern Indian Department in the Colonies-roughly from the middle of the 18th century through the Revolutionary War (American War for Independence). Members of this group portray Southeastern Native people, His Majesty's Indian Department Officers and Employees, Loyalist Rangers and Crown Troops detached in direct support of the Indian Department. 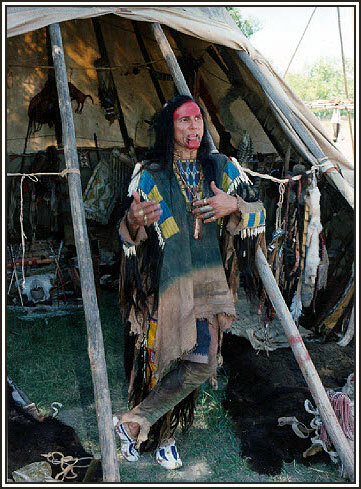 Our portrayal of the Southern Indian Department brings together reenactors portraying both whites and natives to allow a more accurate portrayal of the time period at living history demonstrations, military and civilian historical reenactments, and through public and private exhibitions, lectures, demonstrations, and roundtable discussions. To accomplish this, we help our members grow by sharing research, organizing group events and mentoring of new members. We are actively seeking new members, both individuals and families, who wish to take on a persona within the bounds of our portrayals. Crazy Crow Trading Post is pleased to provide this Native American Indian Powwow & Mountain Man Rendezvous calendar listing to both promote these events and organizations and to assist you in learning of them.